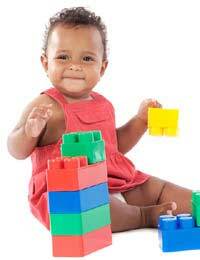 Which Construction Toys Are Suitable for Young Children? Fine motor skills and hand eye co-ordination are improving fast in toddlers and pre-school children, and they love to make things with clay and Plasticine, plus interlocking blocks like Lego and Duplo. When you’re choosing the best construction toys for your toddler, buy bigger sets that can be slotted together with very little effort. Little ones can get frustrated with any toys that are intended for an older age group, so make sure you get construction toys that are for the appropriate age. Check the toy safety labels if you are buying for fewer than three’s as some toys are not suitable for any child under 36 months. If the label says it’s not suitable, don’t ignore this as the toy may not have passed the choke test and could contain small parts that a young child could put in their mouth. As most toddlers can’t make the sort of things that an older child can with their construction toys, buy blocks with a basic set up that already resembles an object like a car or a house, so that rather than starting from scratch, your child can just add and take away pieces to suit them. Construction toys help pre-schoolers with their co-ordination and shape and colour recognition, and they will get a real sense of achievement when they finally manage to make something or get their toys to stay in place where they should do! Which Construction Sets Are Best For Pre-Teens and Older Children? There is a huge range of great construction toys available for this age group. There are boys toys and girls toys and sets that appeal to both equally, so there’s bound to be something that your child will love. The more advanced construction toys designed for older kids don’t just help with motor and co-ordination skills, they also help build on already active imaginations and can teach inquisitive children about energy, mechanics, and even electronics. Younger pre-teens will love making things with small interlocking pieces like Lego sets and Playmobil toys. Any construction tool sets which consist of nuts, bolts and gadgets like Meccano usually go down well. Although Meccano sets are traditionally thought of as boys toys, girls love them too! You could also try construction toys made with magnets where children connect the pieces to create intricate designs, even toy cars.For older pre-teens, there are more elaborate construction toys which sometimes have motors to build vehicles. Advanced Lego sets with themes such as Star Wars are always a big hit with older children, who get to add to their sets as time goes by and create ever more intricate designs as they get more experienced. Whether you're looking for girls toys or boys toys, toys for toddlers or older kids, you can be sure there's a construction toy that they will love. Generally children's stationery items/kits do not need CE labelling, but as soon as an element of play is introduced then they do; the googly eyes may be considered a "play" element. Also craft kits with glue come under the regulations too. You might want to ask at your local Trading Standards office for advice. @crochetmad. There is website called Conformance that sells packs with details of the specifications you need to comply with safety standards.